When Tim and Diane Madden were first searching for a name for their fledgling organization in 1975, they knew more what they did not want than what they felt would really fit. They knew that they did not want names like, “Happy Place”, “Caring Arms”, or “Brighter Day”. “Having come from an Irish heritage, I was traveling in Ireland with a backpack and a skinny budget. I was attempting to reach the old Madden castle, which was some distance from the coast where I had arrived. My only means of travel was by “thumbing”. The days had been cold and rainy and I found myself in a particular town where I sat wet and shivering, and with little moving traffic, it seemed hopeless that I would get a ride. A policeman, who noticed my plight, offered to put me on a bus to my intended location. While on the bus, I had a chance to warm up, dry out, and get some sleep. The policeman’s thoughtful act of kindness is something that I will never forget, and because this all occurred in the town of Dungarvan, it provided the inspiration for the name that now is the masthead of our organization. Not knowing if we needed permission to use the name, we decided to change the spelling to Dungarvin. 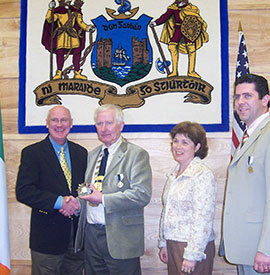 Upon our fifteenth anniversary, we received a congratulatory letter from the mayor of Dungarvan, inviting us back so that we may further enjoy their hospitality. Attached was a note that encouraged us to review our training in… spelling.